Some weeks ago the clothing industry faced yet another scandal. 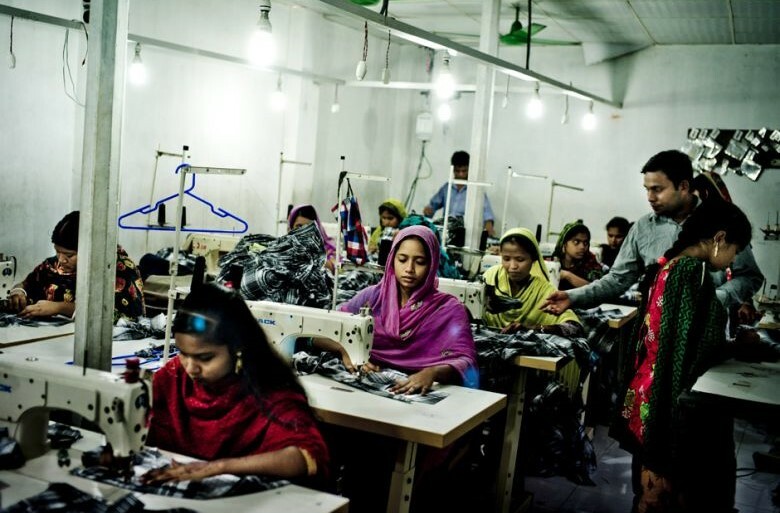 Newspapers moralised about the inappropriate pay -35p per hour- that women workers receive in Bangladesh to produce the newly released Spice Girls T-shirt. The £20 T-shirts features the hash tag #IwannaBeASpiceGirl and a bold “Gender justice” on the back. The recent wave of advocacy for women empowerment, which was echoed initially by the #MeToo movement, has been peculiarly endorsed and amplified by policymakers and celebrities through outfits. Colour dresses in particular seem to have become the vehicle to get women’s voice heard about their social, economic, and/or sexual rights. As never before we watch on media black dresses at the Oscar, total white at the US Congress, and pink hats at the #Pinkprotest. But is this collective rainbow protest really helping or is it just a weapon of mass distraction? These chromatic statements are somehow intertwined with the same contradictions that depict feminist pop-stars selling overpriced charity shirts to fight for gender justice and yet obtaining no societal change. On the one hand celebrities sell T-shirts and use their popular and powerful channels to convey messages which are supposed to mobilise civil society and provide a voice to disempowered women. On the other hand, by buying or trading such commodities, they become part of and further legitimise the intrinsic exploitative and patriarchal mechanisms through which those systems of T-shirt and fashion production are embedded and operationalised. These include unescapable oversight of workers’ conditions and workers’ rights in the pursuit for profit across the globe, and are almost always initiated by businesses located in the global North of the world where most profit goes to, and which exploit often to despair workers, often women, in the South. We may all have realised by now that dumping the responsibility of this dysfunctional system on guilty consumers buying Spice Girls’ charity T-shirts does not solve the causes of injustice, thus the necessity to look more in detail at its underlying mechanisms, and related accountability. As a matter of fact, the vast majority of the T-shirts people buy are not made by robots, are not made by high-skilled tailors in bo-bo London ateliers. The geographical and social segregation is clearly there, they are made in Bangladesh, China and they are made in the cheapest way possible. An OpenLearn interactive course untangles in 15 minutes “The Secret life of T-shirts” . It documents the complex global supply chain of a typical T-shirt you might find in high street shops to understand first who are the different economic actors behind the process of production and exchange but also how big their respective piece of the cake is. The initial stages of production, that is, those who produce the raw commodity and who work the first cuts, make very little money and work in very poor conditions, whereas the later stages of production, that is, those who actually don’t produce anything but have the information, power, and skills to move things around, get much higher financial returns. Some people believe that a low wage is better than no wage at all, some people think that this is the only system that allows consumers to buy cheaply and thus buy more, and thus be happier by maximising their welfare through a reasonably sized budget. But these narratives explain very little and divert the attention from the fundamental structural reasons of why someone ends up paying 35p per hour to women in Bangladesh who produce the t-shirt we buy for 20£ in the UK, and claim to be helping the same women. There are many reasons, but one of them is that, as some economists pinpoint, in economics we stop debating and appreciating value and instead focus on price –price is set up by demand of individuals driven by rational expectation and preferences. As a result, desirable ‘values’ linked to societal wellbeing are certainly recognised, but overlooked in the metrics economists use to judge the economy and thus politician follows to find solutions. The most common measure we use to assess the ‘wealth’ of a nation is what we call GDP. A measure that shows what we produce, how much producers sell, consumers buy, how much money Government spends on services and wars and how much we trade with the rest of the world. For years we have been discussing how this indicator, by ignoring systematically crucial ‘values’ such as workers’ well-being, environmental pollutions etc.., creates a normative bias in the way policies are made and objectives defined. For example, technological change has been often judged positively for being good for society and improving working conditions, but as correctly pointed out on other occasions, as any other good, its outcome and impact on society will depend on how its ownership -and whether the benefit it creates- will be distributed. This example suggests that grasping quantitative changes in the economy as a whole does not help explaining whether society is qualitatively better off. Is everyone benefitting? Or is the pursuit of a meagre wage being of extreme detriment to most? And how are detrimental changes being monitored and supported if they are no one’s responsibility, and GDP is still growing? Thus, such indicators not only risk providing flawed benchmarks, but they incentivise the persistence of unsustainable behaviours. Although attempts already exist to address this normative bias and account for criteria related to workers wellbeing and access to technology, collective responsibility has to be taken and political decisions need to be made to halt this false narrative. Neither the Spice Girls nor the pink hat will be able to revert such exploitative and destructive patterns of production and market exchange, unless the rules of the game start accounting for societal and workers values. Dr Lorena Lombardozzi (@floretta_voice) is a Lecturer in Economics at The Open University, UK. She received her PhD from SOAS, University of London. Her research interests include global commodity chains, agrarian change, labour and work, the role of the state for structural change, and post-soviet economies. Before returning to academia Lorena worked as development economist in Latina America, UNODC in Central Asia and with the European Commission and the Italian Ministry of Foreign affairs in the field of development, trade and environmental policy.